Nice tool chest. It looks like you pretty much have everything covered. I was surprised actually at how close I was to what Chris was recommending. It gives me more confidence in what I have I think. 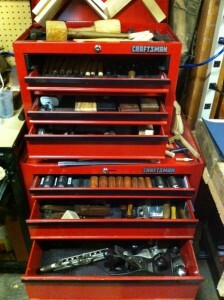 A Craftsman Tool Chest! Very proletarian and appropriate. I have one under a bench, one floor standing an one carryall. All old Craftsman brand. Strangely enough, they do just as well as SnapOn chests would. 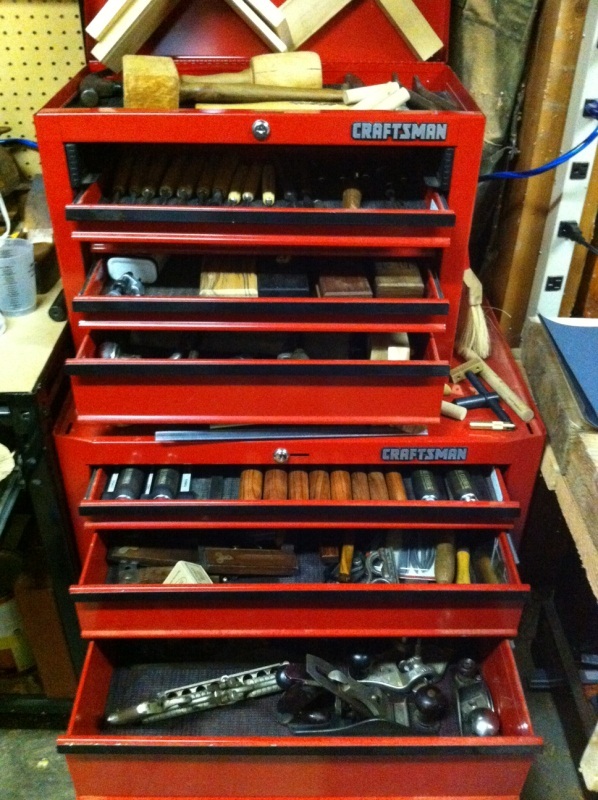 I have one of these chests too, and used it for my hand tools (and power tools) until I got serious. They really are great, despite being aesthetically inappropriate, can’t think of any reason they aren’t fine choices for a hand tool shop. The shallow drawers are amazingly deep, eh? I’m always surprised by how much can fit (and get lost) in there. My real problem is I always want to set junk on top of it, so the bin under the lid is hard to get to.